Muhammad Ali is amongst the most remarkable personalities of our lives and the greatest sportsman ever simply to walk the earth. To honor this living legend, this publisher has produced a work that is certainly indeed epic in scale and hoping to be as unique because the man himself. A worthy tribute to his life should reflect the dimensions of his achievements, and “GOAT – Greatest of All Time” sets seem to meet that task. Four years inside making, as well as the most comprehensive study of Ali as of yet, GOAT tips the scales at 34 kgs (75 lbs) which is 50 cm x 50 cm (20″ x 20″) in proportions. Nearly 800 pages of archival and original photographs, graphic artwork, articles and essays – many previously unpublished – chronicle six decades of his life in stunning detail. To cap everything, the project develops with the participation of Ali himself and the ones members of his inner circle who are closest to him throughout the years: from managers and key cornermen to friends, family and youngsters; from spiritual along with advisers to broadcasters, essayists and journalists. The “Champ’s Edition” incorporates a white silk cover with pink lettering. Limited to 1,000 individually numbered copies, each one of these signed by Muhammad Ali and Jeff Koons. Four gallery-quality silver gelatin prints signed by photographer Howard L. Bingham and Muhammad Ali. Jeff Koons has established an original art piece to the “Champ’s Edition”. 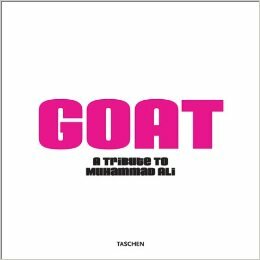 This entry was posted in Biographies & Memoirs and tagged Goat: A Tribute to Muhammad Ali.